Calineczka’s recordings are an intriguing phenomenon – worth a listen, both from the standpoint of sound-art and music – that resonates within the space, but also affects the human body. Michał Stańczyk’s albums recorded under the moniker of Calineczka (i.e. “Thumbelina”) are characterized by their duration. The medium enabling a maximum use of available time is the tape – and this is how his two latest albums have been released. Still, compositions of that length are rather rare, in spite of exceptions to the rule. Stańczyk makes music using a very compact modular synthesizer. His take at drone music is reduced and ascetic, and yet evocative and appealing at the same time. The artist attaches great importance to lengthy sounds, where the most important thing is the harmony achieved by playing the same note throughout the entire piece. He even called his new label Important Drone Records, as if winking at imprints already existing on the market. What Is Music And What Should It Be comprises two compositions, each lasting 45 minutes. Both are very dense, and – with the right sound system – could easily function as a sonic sculpture, a peculiar piece of sound-art, which – again, in the right acoustic conditions – could physically take over the given space, filling it with sound. “(obverse)” is an increasing, monotonous, amorphous sound, which fades out in the finale, while “(reverse)” resonates and seems to undulate, providing a pulsating, sonic massage. Although the sound seems simple enough, like a buzzing unplugged cable, it is the duration, intensity and low tone that are very evocative. All the more so, as the sound changes with each minute – the longer you listen to “(obverse)”, the more decomposed the drone seems to become. There is also the second album, The City Behind the Fence, whose structure seems more traditional. In the first part, we have monotonous drones in the foreground and sonic noise – distortion – in the background. Perhaps this is the distant city behind the fence, impossible to be fully identified by our ears. The second layer of bass comes in in the 11th minute, only to disappear two minutes later, changing into a delicately trembling mist. The sound grows, thickens, and quietens a few minutes before the end, returning to how it was in the beginning. “II” is simpler in terms of form and changes more horizontally – the sound becomes increasingly dispersed and metallic, before it morphs into something completely different. 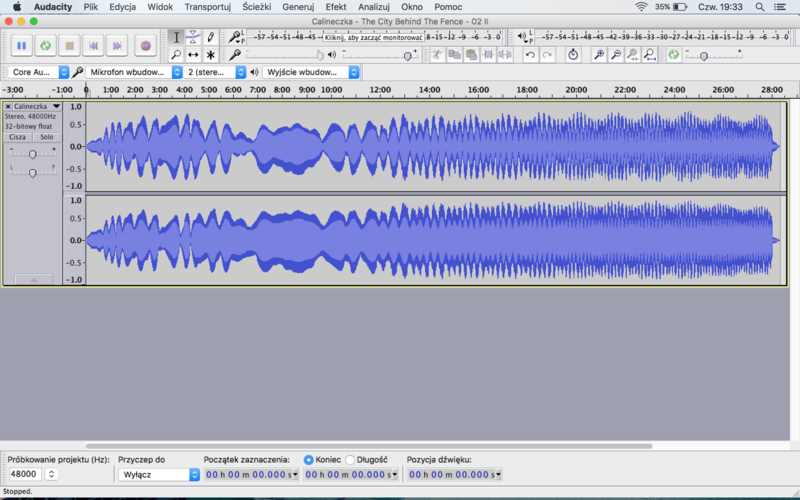 Out of sheer curiosity, I compare the soundwaves of Calineczka’s recordings in Audacity – they resemble sophisticated, psychedelic figures (especially “II” – check it here). I listened to these pieces several times in their entirety, and as I did so, I often felt my mood shift towards a state of numbness or lethargy. The length of the drone is important here, influencing both perception and the general physical and mental condition. I cannot say for sure whether these long drones only have this effect on me, but remembering the frequent and multiple uses of sonic warfare (from actions taken at Guantanamo to the Mosquito device, which emits sounds audible only to under-20-year-olds and is used to disperse gangs of youths), I read they can also be used as e-drugs. This music is available online (on Youtube or I-Doser) – by synchronizing both hemispheres of the brain, it professes to induce listeners into conditions similar to those achieved by taking drugs. To do so, it employs the binaural beats phenomenon, discovered in the 1730s by German physicist Heinrich Wilhelm. Basically, what it means is that both ears pick up sounds with slightly different frequencies, which is why what we eventually hear is the sound resulting from the difference between them – it affects our hearing, and thereby also our nervous system. Can it really be used like drugs? Though there indeed exist sound files titled “Cocaine”, “LSD” or “Marihuana”, a dose of healthy scepticism is advised – all the more so as of them sound incredibly kitschy. Calineczka’s recordings are an intriguing phenomenon that resonates within the space, but also affects the human body (which I experienced first-hand at one of his shows). Perhaps this is the new way of “letting go”, especially since this music requires the listeners’ focus and time. Will it work like LSD? I wouldn’t be reluctant to prophesy the “purple haze” (or even “Purple Haze”) effect, but these unique recordings are definitely worth a listen, both from the standpoint of sound-art and music. * I mean drone music not drones.